Funny how I have never shared this recipe on my blog because I make these biscuits at least once every week. These are so very yummy and they turn out everytime. So here's the link to J.P.'s Big Daddy Biscuits from, of course, the all faithful allrecipes site. I substitute butter for the shortening and Instead of rolling the dough out and using a cutter, I just divide the dough evenly into 16 pieces and simply put them on a baking sheet. Much faster and easier! 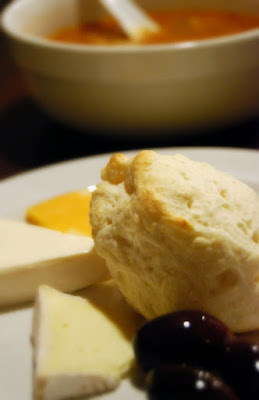 Biscuits served with assortment of cheeses, red wine olives, and a bowl of warm soup. My dinner was, as you can see, scrumptious. I think it's time for a leftovers, night time snack!